Bill Clinton greeted people at the Newton Free Library on Super Tuesday. Former president Bill Clinton’s star power was on full display on Super Tuesday as he appeared in Boston, Newton, and New Bedford to stump for his wife, Hillary Clinton, while voters around Massachusetts cast their ballots in the presidential primary. A crowd of about 200 had assembled outside the Newton Free Library when the former president pulled up at about 10:45 a.m. in a caravan of police cars and Secret Service vehicles and stepped out of a cream-colored sport utility vehicle. “Pull the lever for Hillary!” Clinton declared outside, showing support for the former secretary state as she attempts to squeeze out a victory over rival Senator Bernie Sanders in the Bay State’s primary. “Oh my God! 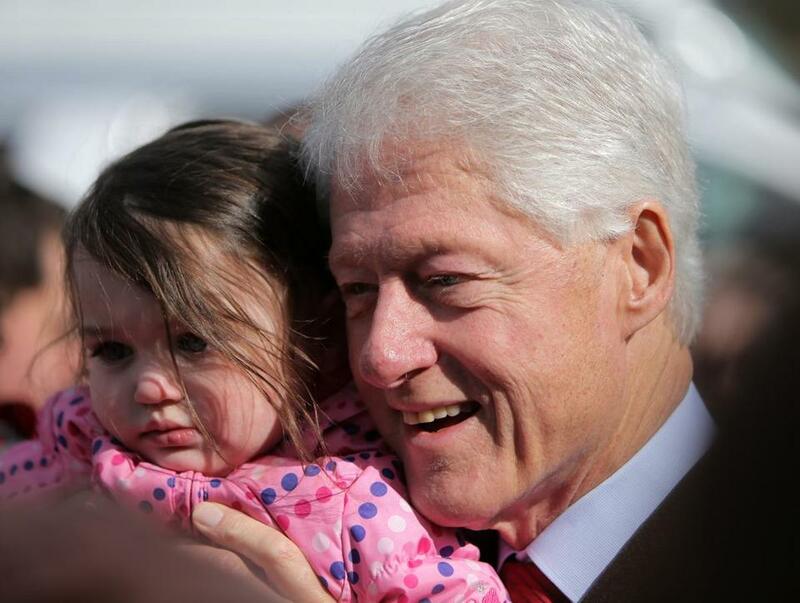 It’s Hillary’s husband!” one man cried out as Bill waded through the crowd, shaking hands, kissing babies, and stopping to have conversations with voters. Hillary Clinton and fellow Democratic candidate Bernie Sanders are close in the polls and in a statistical dead heat according to one. Earlier Tuesday, the ex-president and Boston Mayor Marty Walsh appeared together at a polling place in the city’s West Roxbury neighborhood, where they greeted voters and school children. Walsh said the GOP candidates for president are ‘‘an embarrassment to the office’’ after voting for Hillary Clinton near his Dorchester home. After leaving Newton, Clinton headed to Buttonwood Park in New Bedford where about 1,000 people awaited him, according to police estimates, and he was introduced by Mayor Jon Mitchell. Clinton said Massachusetts had been “very, very good” to his family and that the Clintons had been “pretty good” to the Bay State. Mitchell said Hillary Clinton is “very familiar with this place,” having come to New Bedford during the 1970s to do research for the Children’s Defense Fund on legislation requiring schools to widen acceptance of disabled students. Among those in attendance was Diana Painter of Fair Haven, who wore a button supporting Sanders. “I came because I’m a Democrat first and a Bernie supporter second, and I wanted to be here because I want to be supportive of Hillary just in case,” she said. A 94-year-old woman on her way to vote at the nearby polling place said she had missed Clinton’s appearance by minutes. “I am here and I am going to stay healthy to keep voting for Hillary,” she said. 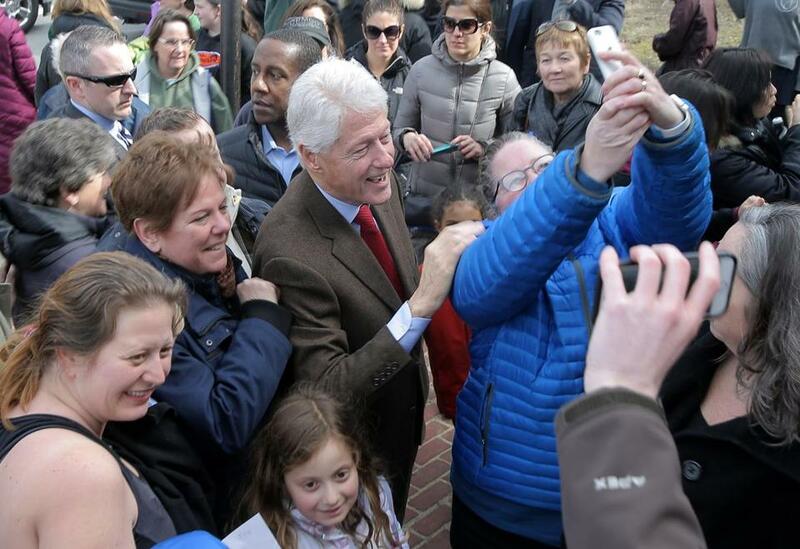 Bill Clinton posed with supporters in Newton.